What do you get when you combine 1.2million people crowding a city of 500,000 to dance and party? Well in Germany it’s called the Love Parade and it is truly something to behold. I woke around 9:30 am to get some breakfast and noticed that another of the bunks in the 5-bed dorm I was staying in was filled. Sometime after breakfast we introduced ourselves, his name was Juan Jose (Juan-Jo for short) and he had come in from Madrid for the Parade with a couple of friends. Later he invited me to join the three of them and get some lunch before heading down to the parade. They wore matching red shirts with a white bull on the front, representing the part of Spain they were from, and all three were incredibly nice guys. We drank a little before heading down to the parade. Some whiskey and coke and a Corona with a Doner Kebab. We didn’t see throngs of people heading for the stations so we thought maybe it was slow to start. 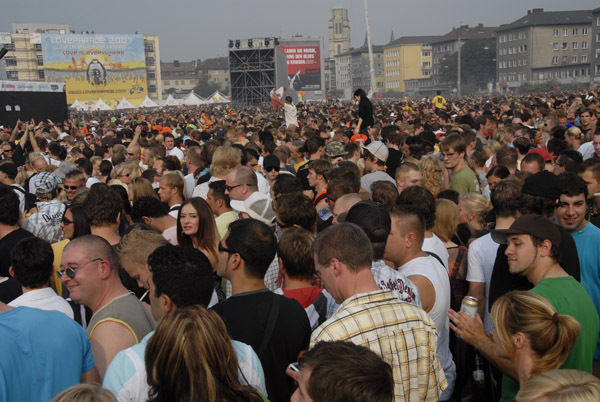 This is the first year the Love Parade has been anywhere outside of Berlin since it began in the 90’s. After boarding the U-bahn towards BerlinerPlatz we discovered that we were just further out than the rest of the party goers. The next stop on the line opened to the cheers of people packed into the terminal and 30seconds later the train was overflowing. Two stops further and the cheering crowd poured out of the train and we followed. Exiting the station we could hear the music and the horizon was full of people as far as you could see. We wandered about, taking in the spectacle and then dived in to the center. I started taking pictures and people started jumping in front of the camera and grabbing their friends. What’s funny is almost always after they asked for a card showing where they could see the picture. It’s funny because a few years back I ran a nightlife website for Portland clubs (R.I.P. PDXCLUBPIX) and that’s exactly what we’d do. Snap a picture and hand out a card. I had cards printed up for an easy way to point people to this site before I left so I handed some of those out. To those of you that thought I was shooting for a magazine or online publication, sorry, I’m just a traveler, but like I promised you can see your pictures by clicking HERE. Everyone I talked to that day was friendly and happy to be there. We stayed and danced and drank until the wee hours and then headed back to the hostel for some short sleep before our respective departures the next morning. Thanks again to my new Spanish friends for letting a goofy American tag along! Funny I was just thinking about how I needed to tell you about doner kebaps. I love Germany!! That guy with the b&w nike hat looks dead or like he just killed someone or he is gonna kill you!!! He scares me!!!!!!!!!!! (he is in the backround in two of the pics). Fabulous pictures! Looks like you’re having a great time! Im Juanjo from Essen, Love Parade!! Now Im in Madrid, but just for a day, I return to Alicante. Sorry, because i didnt say you goodbye!!! jejejjej But was so early on Sunday!! I hope you will come to Madrid!! See you in Alicante, good luck in your trip!